Professor Sandra Guerra Thompson has written a timely book addressing forensic reform in our legal system, Cops in Lab Coats: Curbing Wrongful Convictions Through Independent Forensic Laboratories. 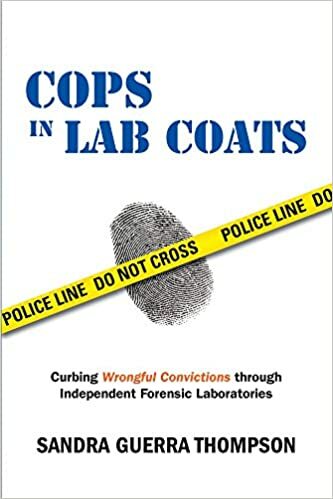 The Ohio State Journal of Criminal Law is publishing my book review of Cops in Lab Coats next Spring, and I am delighted to share excerpts from the book review on this blog. Happy reading, and I look forward to any comments. Law enforcement’s past cover-ups of faulty forensics is at the heart of Sandra Guerra Thompson’s new book Cops in Lab Coats: Curbing Wrongful Convictions Through Independent Forensic Laboratories. Thompson posits that forensic labs should be independent of police departments rather than controlled by prosecutors and used to convict persons no matter the human cost. In brief, Thompson’s book captures the recent history of forensic validation—and invalidation—and its critical impact on the criminal justice system. Next Next post: Who were the victims?